I am not a very good illustrator. I’m untrained and I don’t practice as often as I should. However, I am pretty good at building stuff. Big stuff and little stuff. Materials and their manipulation are my second language. And building stuff requires tools — lots of them. So early on it was natural for me to solve my unsatisfactory illustration results with trying out different tools and materials. I made dozens of trips to the art supply store to try out new pens, pencils, brushes, and paper. Try as I might, the line was too fat, or thin, or uniform, or varied. I struggled with scale. I couldn’t draw and ink small enough to get the detail I wanted but if I drew the image larger and then reduced it electronically to the size of the finished piece the line weight was all wrong and there were places that had too much detail that could not survive the acid etching process. This went on for years and then I laid my hands on two new tools: a Wacom tablet and Adobe Illustrator. Finally the image I had in my mind began to take shape before me. It was astonishing how quickly it happened. Certainly part of this success was a result of my earlier struggles but a big part of it was finally using the right tool for the job. 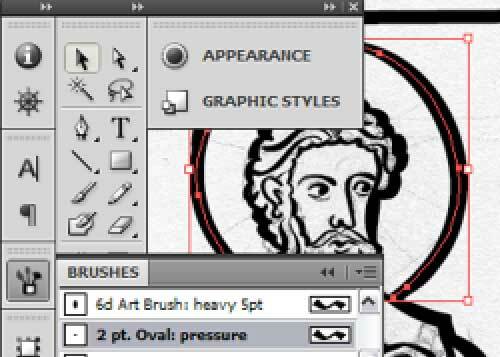 I’m still not a good illustrator and I will never be able to claim the artistry of any of the Medieval masters that I emulate but at least this crutch of technology helps me fake it more convincingly. This entry was posted in making and tagged adobe, illustration, software, wacom. Bookmark the permalink.